Magnetic core memory: Just like mom used to make! It is only 10 am and I am already bored at work. That means another thread about crazy old computer technology from the 1960's!!! I also figure this might help all of the aspiring young hardware nerds out there see how things were done back in the day. Yes, there were computers back before we measured speed in gigahertz. Remember megahertz? How about kilohertz? How about memory measured in words rather than bytes? Well, core memory sure does. This is core memory! Back in the early 60's computer technology was still in its infancy. At this point we had moved beyond using delay line memory and vacuum tube based memory (although it was still in use), but had not yet mastered the art of creating silicon based RAM chips as we know them today. To meet the ever expanding needs of the computer industry for faster, higher density, and more reliable main memory, core memory was developed. This memory technology uses thousands of tiny donut shaped magnets strung together in a matrix with a grid of wires. Each ferrite core as the magnets were called could hold a single bit of data. The bits themselves were represented by the magnetic charge held by the magnet. Each magnet had 3 wires (or 4 in early models) running through its center. These wires were used to create the magnetic charge, remove the charge, and to read the state of the charge. Here is a diagram! The red and blue wires running through each magnet are called driver lines. In order for a magnet to become charged (and thus hold a 1 instead of a 0), current had to be running through both driver lines at the same time. If only one of the driver lines at a time were live, the magnet would not gain its charge. This allowed the computer using the memory to read and write to specific bits without altering the state of adjacent bits. The third wire (green in the diagram) was called the sense/inhibit line. It's job was to read the state of a bit. Now if you look closely at the diagram, you will notice that there is only a single sense/inhibit line for the entire matrix of core memory. This means that only a single bit at a time can be read from any particular core memory frame at a time! Thats not even the fun part. Core memory holds the dubious honor of being one of only a few memory technologies where reading the value of the memory actually destroyed the value! If you had a bit that you wanted to read in core memory, the way you did this was to write a 0 to that bit. If the bit was a 1 to start with, a pulse would be generated on the sense/inhibit line. If you wanted to keep the bit a 1, you would have to follow up the read with a write in order to set the bit back to a 1. Ah, the price we pay for not using giant tubes full of mercury or glorified light bulbs to hold our data! As you can see here, a core memory matrix had a look and feel similar to that of chain mail. 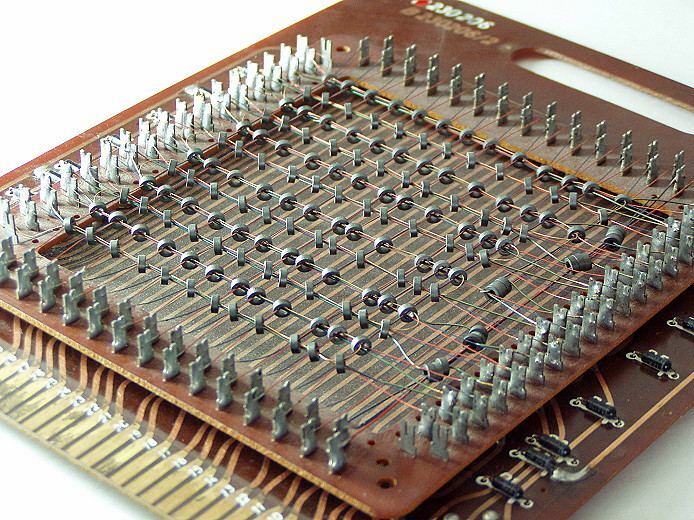 Without its supporting frame, core memory was a bit like fabric in that it could bend and flex.The analogy to fabric is a bit more literal than one might think, as core memory had to be woven by hand! Thats right, armies of seamstresses had to wire this stuff by hand. No mechanical method of producing core memory was ever developed. This is partly due to the interweaving wiring pattern that required the wiring to run at 45 degree angles to the axis of the magnetic cores. As density increased, the work of putting new core frames together became more and more intricate. Seamstresses would have to work under a magnifying glass as the size of each core shrank to the size of a pin head. China rose to the challenge, providing the world with plenty of core frames produced by workers for pennies a day! Some things just never change. Core memory had some interesting properties that made it very useful for certain applications. First of all, it was very durable compared to other contemporary memory technologies. It had no moving parts, was non volatile, and was resistant to heat and electromagnetic interference. It served as the main memory for many military and aviation applications. Early versions of the space shuttle used core memory for their computers. A grim testament as to how durable this stuff was occurred in 1986 when the Challenger space shuttle blew up shortly after launch. The ill fated shuttle's core memory unit survived not only the explosion, but the long plunge into and submersion in the ocean! Core memory is also resistant to EMP pulses generated by nuclear detonations that would fry conventional electronics. This made it a favorite int cold war era military installations. Compared to today's memory technology, core memory is several orders of magnitude slower and less dense, but back in the 60's and early 70's it was good stuff. At the end of this technology's life, the access times were down to about 600 ns, compared to about 6 ns for modern RAM. Multiple frames of core could be used in parallel to allow access to whole words of memory at a time at an increased speed. In 1980, the density of come memory reached approximately 32 KB in a single 25cm x 20cm frame, yielding about 65 bytes per square centimeter. Today you can fit 4 gigabytes or more into the same space. As we all know, the mid 80's saw the introduction and wide availability of the silicon based ram chips that we know and love today. This new memory technology relegated core memory to a million dusty boxes in a million dusty closets all over the world. As with many things in this world, ancient core memory frames can be purchased on ebay for as little as 24.99! Look up core memory and skip past all of the guys blathering on about core 2 duo compatible ram, and you should see a few rusty old core frames up for sale. They make great (horrible) Christmas presents for the computer enthusiast in your family! Re: Magnetic core memory: Just like mom used to make! I don't think you would want actual magnets. What you would need are small rings made of a ferrous material that can be magnetized. That and a lot of wire. You would probably need to do everything on a larger scale, meaning larger cores, thicker wire, and higher voltage than older core memory. I'm sure the docs are out there somewhere that describe how to wire the matrix. The tricky part would be designing a memory controller to access the memory. Your best bet would be a very simple serial port based controller assembled from TTL chips or something. It would be a really cool project! If you could get anything to boot off it I would be impressed. Got 256kB of it? If so, we might be able to wire it into a 30 pin SIMM slot. davean wrote: Got 256kB of it? If so, we might be able to wire it into a 30 pin SIMM slot. Well, you'd run it into a converter chip, and that into the bus. Core memory is 600ns though and 30 pin is 60ns. This is a small issue but JESD-21C may have something like a failure-retry code and you could start requesting it when the call comes in, fail and buffer it , failing until you have it. "As we all know, the mid 80's saw the introduction and wide availability of the silicon based ram chips that we know and love today." Umm, more like the mid 70s. The 1k bit Intel 1103 was introduced in late 1970, the 4k bit Mostek MK4096 DRAM in 1973, and the 16k 4116 in 1976. Core was only used for legacy and specialized applications after that. tinyterror wrote: I don't think you would want actual magnets. What you would need are small rings made of a ferrous material that can be magnetized. That and a lot of wire. You would probably need to do everything on a larger scale, meaning larger cores, thicker wire, and higher voltage than older core memory. I'm sure the docs are out there somewhere that describe how to wire the matrix. The tricky part would be designing a memory controller to access the memory. Your best bet would be a very simple serial port based controller assembled from TTL chips or something. It would be a really cool project! More specifically than just ferrous magnetizable material, you need a ferrite with a wide hysteresis loop. Wikipedia explains it better than I can. Once you've got that though, it's not very hard to make a controller (if you have lots of time and solder). If you want to write a 1 to a specific bit in the grid, apply a voltage to both wires that pass through that bit, in the same direction (see how they're arranged diagonally?). If you want a 0, apply the voltage in the other direction. If you want to read, write a 0, check if the sense line wiggled, and if it did, write a 1. That's all you need to know. The rest is just logic gates and lots of free time. Have fun! Anyway, this is even older than most core memories I've seen (I have seen a couple of different kinds in real life). And a filename like "kernspeicher", just makes it better. Now excuse me while I put some really old Kraftwerk on. That was interesting. Thanks for the read. so, to apply a zero, you would apply a voltage in the opposite direction of the voltage you apply to make a 1? hintss wrote: so, to apply a zero, you would apply a voltage in the opposite direction of the voltage you apply to make a 1? Sort of. You would apply a flux to the core in the opposite direction. Which usually means you would apply a current. But I see lots of opportunities for controlling flux by doing a constant voltage over a very short time (since the cores end up being inductances, after all), so they might be doing that instead. Thats not even the fun part. This would be fun for academic value. Larger memory arrays work on much the same design as core memory, just on a different scale. The magnets are great and showing how memory works visually. Also, you could have students apply voltages in different places to simulate reads and writes. If you understand how to interact with core memory, you understand how to interact with modern caches. Neat bump. Out of curiosity, why is this resistant to EMP? The things a giant tapestry of magnets; I'd think it'd be just as susceptible to EMP as any other bit of electronics. But huge voltage spikes are less likely to blow out components. Sure it might crash the computer, but after a reboot you're fine. Why? And why wouldn't a huge voltage spike erase the magnetic charge on those ring magnetics, which the OP said got smaller than a pin head by the end of their utility? Well yes, the data could be destroyed, I suppose, but presumably you have some other mechanism for long term storage, and you could load from that. What I meant is that you're not going to physically damage the computer (much) assuming you built it in an EMP resistant fashion, possibly using vacuum tubes. Computers back then could probably take voltage hits that would completely destroy modern ICs with billions of nanoscopic transistors. Oooh, it's not about the data, but the physical hardware. Izawwlgood wrote: Why? And why wouldn't a huge voltage spike erase the magnetic charge on those ring magnetics, which the OP said got smaller than a pin head by the end of their utility? No, a high voltage charge would not do that. At least not unless you're talking about a bolt of lightning. Naturally magnetic material is not that simple to demagnetize. And that thing stops storing data the instant it's power is turned off. It's pure RAM, not a data storage device. Izawwlgood wrote: Oooh, it's not about the data, but the physical hardware. My understanding is this is correct: the changing magnetic field caused by the EMP induces currents that burn out circuits. Don't quote me on that though. The idea that modern electronics are somehow more susceptible to older ones is confusing to me. Chips are tiny yes, but they are well insulated with protective material. 70s electronics had exposed components which were very vulnerable to various external things as simple as humidity. Vacuum tubes were high voltage devices that literally burnt out on their own after not much use. The stuff we use today is actually fairly robust. Some of it is even specifically designed to work in salt water, the near zero temps and total vacuum of space, and beyond. Certainly this old memory circuit is no more stable than a DIMM. It can cause a fire simply by a conductive yet flammable piece of paper landing on it when it's on ffs. They don't build em like they used to: They build them to last now. Seriously, too much nostalgia is a mental disorder with some folks. mosc wrote: The idea that modern electronics are somehow more susceptible to older ones is confusing to me. Modern solid-state electronic devices are more vulnerable to EMP in particular and transient high voltages in general than older tube-based ones, despite being more robust overall. You can put a thousand volts across a tube with negligable impact, but a thousand volts across the pins of a transistor will give you a small explosion and a horrible smell. Other old-fashioned components tend to be similarly durable. Thousands of volts across an amplifier tube maybe, but not one designed as a relay or diode (or a transistor type layout). No, you are exaggerating wildly. Also, modern IC's are insulated. Tubes have large exposed connectors. mosc wrote: Thousands of volts across an amplifier tube maybe, but not one designed as a relay or diode (or a transistor type layout). No, you are exaggerating wildly. Also, modern IC's are insulated. Tubes have large exposed connectors. Thousands of volts as a blanket statement across all tubes is probably an exaggeration, as you say. The fact remains though that firebottles can take a lot more voltage than ICs. Have you tried reversing power and ground on a fairly complex chip? Or giving 20V to a chip rated for 3.3V? I have done these things, and I very quickly had non-working chips. Also, insulation doesn't stop EMP. You'd need a faraday cage, without wires going through. Obviously, ICs are a vast improvement over vaccum tubes for almost all applications of practical relevence. However, tubes do have a slight edge in EMP resistance, if you don't consider the possibility of keeping 10 spare IC based parts in a faraday cage, and swapping out the broken part whenever the enemy uses an EMP weapon (because when transistors cost nanocents each, you can do that; Moore's Law to the rescue again ). Weaponized EMP is a pop culture myth. You can generate an EMP pulse with a nuclear bomb, but it'll only be localized in an area that's, well, in the middle of a nuclear bomb explosion. Arguments about emp-resistance aside, I would have loved for this sort of project in early computer science classes. mosc wrote: Weaponized EMP is a pop culture myth. You can generate an EMP pulse with a nuclear bomb, but it'll only be localized in an area that's, well, in the middle of a nuclear bomb explosion. Additionally, there are many pieces of hardware that would be much more resistant to a pressure wave than an electromagnetic one, anyway. That's about as witty as something not witty. This is exactly what I'm talking about. If you think a piece of magnetic core memory is MORE resistant to this type of thing than a piece of DRAM, you're insane. EMP exists. No, it has no relevance to anything related to even military grade hardware.